There is an old Russian custom in which bread and salt are provided as a traditional housewarming gift as a show of hospitality to new neighbors. While the origins of why bread and salt were selected vary (one suggestion indicates that both contributions are critical ingredients to any meal and therefore enough to make a party). The Jewish faith has adopted this custom, with the addition of sugar - bread that the house never knows hunger, salt that life always has flavor, and sugar that life shall always be sweet. On October 5th, two of our Institutes, the Purdue Institute for Integrative Neuroscience and the Purdue Institute for Inflammation, Immunology, and Infectious Disease will have a housewarming of their own. We welcome the entire community in "making a party" to celebrate the opening of the newly renovated space in the Hall for Discovery Learning Research. The event will start at 3:30 with some opening remarks and continue with tours of the space, new facilities, and instrumentation. Bread, salt, and sugar will all be provided in some form or another. Join us. Funding Opportunities in the Life Sciences can be found here. 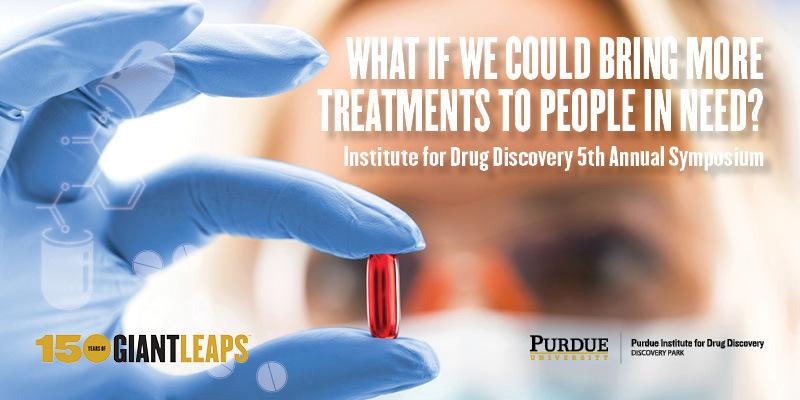 The 5th Annual Institute for Drug Discovery Symposium will occur next Friday, September 28 from 9:00 a.m. - 5:00 p.m. in STEW 218. Please plan on joining us and encourage your students to attend. This is an Ideas Festival 150th Anniversary event for Health and Longevity. The winners of the Institute for Drug Discovery’s Programmatic Areas call also will be announced and winning teams will be making short presentations of their programs. Additionally, talks will be given by internal Purdue faculty, late breaking research will be presented and a grad/post-doctoral student posters will be on display over the lunch period. Registration will be closing soon, so please register here. Dear PI4D members and friends, I would like to personally welcome you to join us in celebration of our Grand Opening of the 3rd and 4th floors of the HDLR on October 5th. The celebration starts at 3:30 pm with food and soft beverages, tours of our facilities and a time to come together at our new home for collaboration and innovation. I hope to see you here! Dr. Saiyed is the CEO and Director of the Centre for Cellular and Molecular Platforms (C-CAMP) at the National Center for Biological Sciences (NCBS) in Bangalore, India. On September 10-11, Dr. Saiyed visited Purdue campus and the Purdue Research Park and met with various members of the Foundry, PRF and the Bindley Bioscience Center. We continue to explore strategic partnerships with our colleagues in India. On September 5th, Tommy Sors, PI4D Assistant Director, was invited to speak at the NIH RockyMountain Laboratories. Dr. Sors was invited by the Research Fellows Organization to give a talk on career trajectories. During his visit, he was hosted by Purdue alum Jeff Grabowski (PhD Biology ’16). This coming Monday, September 24th, Purdue will host the 2nd Purdue University / Indiana University Joint Symposium on Brain and Spinal Cord Injury Research. Our keynote speakers will be John T. Povlishock, Ph.D., Professor and Chair, Department of Anatomy and Neurobiology at Virginia Commonwealth University and Jerry Silver, Ph.D., Professor, Department of Neurosciences at Case Western Reserve University. Also, several faculty members from Purdue and Indiana University will present their research work. The event will finalize with a social hour and a poster session by students from both institutions. CTSI is co-sponsoring this event with PIIN. The Michael J. Fox Foundation is accepting pre-proposals for its Core Funding Programs (Target Advancement, Therapeutic Development and Outcome Measures). Pre-proposals are due in late September, 2018. Indiana CTSI is accepting proposals for the 2019 Spinal Cord and Brain Injury Fund Research Grant Program. Call to all research Scientists: ALZgerm.org is accepting submissions for its 2021 Alzheimer's Germ Quest ChallengeAward. The Brain and Spinal Cord Injury Seminar Series continues this semester, and PIIN is partnering with the Institute for Drug Discovery to bring you new and exciting speakers and topics. Seminars will occur every other Wednesday from 4-5 pm in the Drug Discovery Lobby Conference Room. July 9, 2018 marked the 40th Anniversary of the PCCR’s designation as a National Cancer Institute Basic Laboratory Cancer Center – one of only 7 in the United States! To commemorate this occasion, we are kicking off a year-long campaign: Research That Delivers. We’ve created a special website that profiles our researchers and advocates. To promote collaborative and translational cancer research, we are launching a new seminar series titled “Discovery to Translation”. Please follow the link to see all currently planned talks. Dr. Danzhou Yang, Professor Medicinal Chemistry & Molecular Pharmacology, will be giving the next talk titled “DNA G-Quadruplexes in human Gene Promoters and Telomeres as Anticancer Drug Targets” on October 17 at noon in the Drug Discovery Lobby Conference Room. Our internal Phase I Concept and Phase II Mature awards were released on Monday, September 10. FASTR meetings are required for both awards; please schedule those meetings with Doug Cuttell no later than October 19, 2018. Electronic applications should be submitted by 5 pm on November 16, 2018. Our complete Internal Funding Pilot Grants Calendar can be found on our websites internal funding opportunities page, via the “Master Pilot Grants Calendar FY18-19” link. September 27: Dr. Zhong-Yin Zhang, PhD will be giving a talk titled “Targeting Oncogenic Phosphatases for Novel Anti-Cancer Agents” at 11:30 AM in the Drug Discovery Lobby Conference Room. October 4: Dr. Christine Schaner Tooley, Ph.D., will be giving a talk titled “NRMT1 and Cancer: Misregulation, Mutation, and More” at 11:30 AM in the Drug Discovery Lobby Conference Room. Associate Director Yuehwern Yih will serve as co-academic director of a new $70 million consortium to co-create research solutions for developing countries. The consortium is called the Partners for University Led Solutions Engine (PULSE) for USAID’s new Long-Term Assistance and Services for Research (LASER). PULSE will help USAID identify research challenges in global health and food security. Supporting partners in the consortium are Indiana University, Notre Dame, Makerere University in Uganda, and Catholic Relief Services. The findings will be translated to a network of over 120 lower-middle income countries. Additional details about the new center may be found here. RCHE’s Regenstrief National Center for Medical Device Informatics (REMEDI) was chosen by the Institute for Healthcare Improvement (IHI) as the recipient of this year’s IHI/NPSF Lucian Leape Institute Medtronic Safety Culture & Technology Innovator Award. Led by Managing Director Rich Zink, REMEDI is being recognized for work to advance the safety of infusion pumps, which are commonly used in health care to administer medication or nutrients intravenously. “Smart” pumps use software that helps ensure the right dosage is being delivered at the correct rate and can also alert clinicians to adverse drug interactions. Full details may be found here. Save the Date – We will have a networking reception for RCHE-related faculty and staff and give brief center update. If you are interested in learning more about RCHE and have a time to meet socially with us, please come by. The reception will be Wednesday, September 26 from 3:30 pm-5:00 pm in Mann Hall.